The first young birds we’ve seen this year were these Moorhen chicks on Polgigga duckpond near Land’s End. The chicks provided considerably more entertainment than the Night Heron sat on the waters edge only a few yards away! One of the fascinating things about birding is that a common bird can at times provide as much interest as a rarity. Mind you, I don’t suppose any of the twitchers present would have even got the car out of the garage let alone driven the long distance some of them had in order to see a Moorhen! 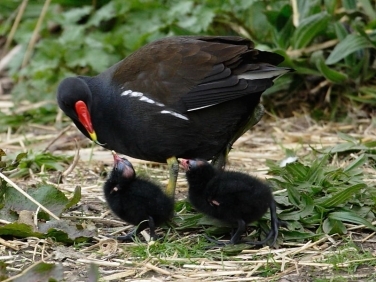 Insight into Moorhen (Gallinula chloropus): one of the commonest freshwater birds seen throughout the UK apart from in the far north west of Scotland.